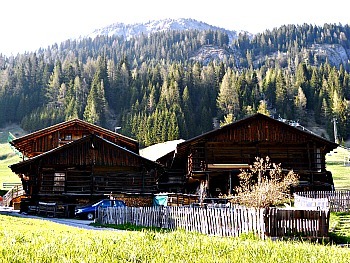 Sappada and the Val Visdende: Charming Wooden Chalets and Imposing Conifer Forests. 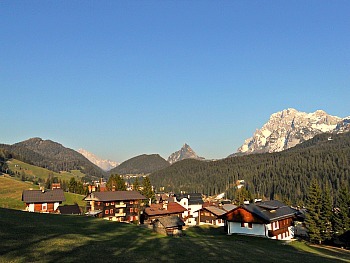 Sappada (whose natural setting is portrayed above) is a village with a very peculiar and interesting history. It was founded by German settlers in the 11th century, and still to this day a German patois is being spoken here. The village is part of a group of German-speaking communities that can be found in several parts of the Southern Alps and which all date to the Middle Ages, when German populations moved south in search of safety at the time of the Barbaric invasions. Such communities can be found in Valle d'Aosta, Piedmont, Trentino, Veneto (the 'Sette Comuni' and the area of Cansiglio) and also in nearby Friuli (Sauris). You may just hear this peculiar language spoken on the streets, but its first evidence, if you’re not familiar with the place, is perhaps to be found in the name of the fifteen hamlets that form the municipality, most of them bearing German-sounding names that are usually also the surnames of local people (for instance, Pill, Kratten, Bach, Cretta; even Sappada itself has a German equivalent – Plodn – that you will notice on street signs). 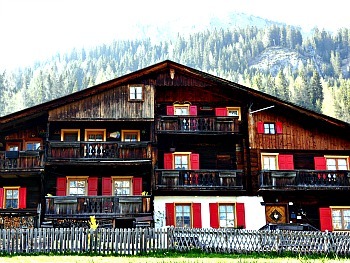 The vernacular architecture is really the highlight of a visit to Sappada, because as an area of German cultural background it has maintained the fundamental characteristic of wood being used as the main building material, as opposed to stone (in the image below, a typical Sappada house, composed of multiple blocks inhabited by different families – this type is known as 'multifuoco' in Italian, and it is mostly built in wood). On this respect, and for the sake of clarity, when it gets to the preferred building materials in ancient times – until the middle of the 19th century, at least – it is generally safe to assume: Latin people = stone; German people = wood (even though, of course, there are exceptions to this rough rule). If you walk the hamlets around Sappada, then, you may be surprised to find an incredible number of well preserved, old wooden houses – the highest concentration of which, perhaps, is in Kratten, Cretta and in Borgata Cima. Some of these houses date back to the 16th century, and they really are to be considered monuments in their own right (below, a group of old wooden houses in Borgata Cretta). In Borgata Cretta you can also enter one of these houses, hosting today the “Casa Museo della Civiltà Contadina” – a small museum dedicated to traditional ways of life and ancient forms of land use in agriculture. Each Borgata (or hamlet) is generally quite well-preserved, and formed by a cluster of old houses grouped around a chapel and a fountain; this type of organization is really the dominant characteristic of Sappada, in which – as you stroll – you will find one atmospheric little corner after the other (such as the one portrayed in the picture below), divided by stretches of open meadows and pastures. 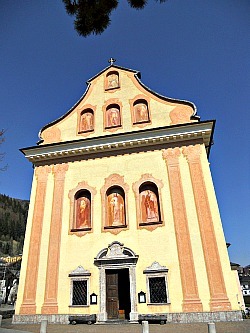 In Borgata Bach, the local Ethnographic museum is hosted in the town hall, while in Borgata Granvilla the parish church of Santa Margherita was erected in the 18th century with an airy and pastel-coloured Austrian baroque style – a clear reminder of the link between Sappada and the Germanic world (see a picture of the church's main façade below). One should not forget, however, that Sappada is also the most important resort in the province of Belluno after Cortina d'Ampezzo, and that therefore you will find lots of hotels and other built infrastructures here, mainly directed at winter sports; nevertheless, there aren’t many obtrusive buildings, and the place has managed to retain a certain sense of harmony despite the new developments. Many houses also display pleasant frescoes – some ancient, some modern – which add a note of colour to the built environment. 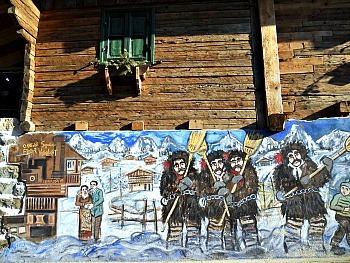 The ancient depictions are usually of religious theme, while the modern ones make references to other aspects of the local traditions (such as the one pictured below, which portrays the typical characters of the Carnevale di Sappada, a famous yearly event). Of course, there are also beautiful natural areas to be explored: the Springs of the Piave can be reached with an easy excursion from Cima Sappada up the solitary Val Sesis. The river springs at an altitude of around 1,880 m just under the peak of Monte Peralba (2,693 m), in an area that was affected by fights during WW1. In fact, the whole lenght of the Piave follows quite closely the old frontline, sometimes coinciding with it; as a result, many epic bitter fights took place along its course, and – precisely for this reason – this river is also known today as "Sacred to the Country". The sources of the Piave are also one of the termini of the Alpine Highway No. 6, the so-called "Alta Via dei Silenzi" ('of Silences') – a long-distance trek that runs from here along the very little frequented ridge (hence the name) that divides Cadore from the Dolomiti Friulane. This long-haul trek ends at Vittorio Veneto, at the foothills of the Pre-Alps. A bit further to the south, past the impressive Acquatona gorges – where the Piave has carved its way among massive rock boulders – there is yet another diversion into the magnificent Val Visdende. This valley is so beautiful that, in fact, it seems to derive its very name from this characteristic: “vallis videnda” in Latin – that is, “a valley worth seeing”. Still to this day, the Val Visdende is an incredible expanse of pristine mountain scenery, with majestic spruce forests extending as far as the eye can see, and amounting in total to about 6,000 hectares. The fact that the area managed to remain so un-spoilt is due to the presence of the local Regole – ancient communal organizations dedicated to the protection and sustainable use of the natural resources, long before the concept of ‘sustainability’ was even created. 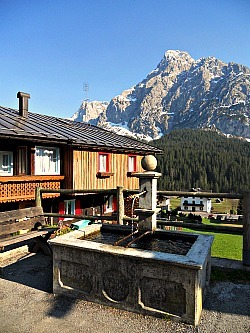 We have encountered the Regole also when talking about Cortina, as these institutions are at the core of the local land organization in several districts of the Dolomites. Another point in favour of the Val Visdende is that it can be accessed by car only as far as Cima Canale – the flat basin right at its centre, at the confluence of two minor valleys – after which one can only proceed on foot. Needless to say, the possibilities for walks and treks in altitude are endless from here – and especially beautiful are those towards the high mountain ridge that separates the two branches of the Val Visdende from South Tyrol and Austria on the other side. There is also the possibility to connect with paths that would take you into the sub-region of Comelico, past the western section of the Val Visdende ridge.